Karan Johar shared a selfie on his Instagram story recently and guess, who featured on the photo with the filmmaker? It was none other than actress Kajol, whose film Helicopter Eela is all set to hit the screens on Friday. Karan Johar, who attended the special screening of Kajol's upcoming film recently shared, the photo on his Instagram story and captioned it Eela (Kajol's name from the film). 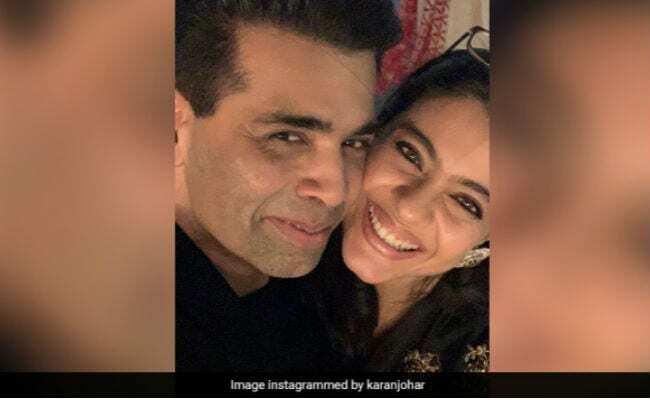 When the trailer of Helicopter Eela was released on Kajol's 44th birthday, Karan Johar shared the video on Twitter and accompanied it with a sweet caption. "Kajol is stunning and absolutely wonderful as ever! Lights up the screen in every frame of this lovely trailer! Great tone and seems like a fun and emotional watch," Karan wrote. Kajol and Karan Johar had been friends and frequent collaborators for about 25 years until in 2016 when they had a fall out. It was later reported that the duo repaired severed ties after it was noticed that Karan Johar has started following Kajol on social media last year. Though we aren't sure who initiated the first step towards friendship, but reports suggest that Kajol invited Karan to her birthday party last year and he obliged. After Kajol attended Hiroo Johar's birthday last year, the Karan shared a photo on his Instagram timeline, which featured Kareena Kapoor, designer Manish Malhotra, Kajol and himself. Helicopter Eela also features National Award-winning actor Riddhi Sen, who plays her onscreen son Vivaan, Neha Dhupia and Tota Roy Chowdhary. Kajol plays the titular character in the film. Eela D'Souza plays a single mother, over protective about his college-going son. Helicopter Eela is directed by Pradeep Sarkar.